Your website is your online storefront. It is the face of your business, giving potential clients that first impression of what to expect if they dial your number. You must ask yourself – If I were looking for an attorney and came across my site, would I pick up the phone? How many clients per month is your website costing you by giving the wrong first impression? FirmFinder has the knowledge and expertise in attorney marketing to create a law firm website design that is not only informative, but will put paying clients in your office. Stellar Support Our support is our biggest advantage. When you work with us you’ll get speedy support and we’ll always exceed your expectations. In many cases, we’ll know your website has a problem before you do and we’ll begin working on a solution before you even submit a support ticket. Full Site Backups Keeping website backups is a thought that’s in the back of most of our minds, but it’s not something we act on until it’s too late. We’ve even heard horror stories of people who were backing up their site to their webhosts when the webhost server crashed losing the original files and the backups too. 24/7 Security Monitoring Security is a huge concern when talking about the information superhighway. Hackers are everywhere and malware infections can put your content at risk and potentially do harm to your site visitors. Just one virus from your website and you can almost guarantee that person won’t return to your site. Site Performance Few things are more frustrating than a slow website. In fact, Google even punishes websites with slow load times. 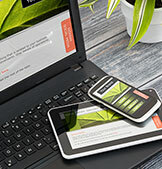 We love to help make our law firm website designs fast. Aside from installing and properly configuring a great caching plugin, we’ll take a comprehensive look at your site and get it running smooth. A few examples of our work. Want to see more? Shoot us an email! Taxes can always be a stressful issue, even if everything goes as planned. However, if the IRS challenges certain aspects of your taxes, the situation can be downright frightening. Make sure you do not subject yourself to unnecessary penalties by not having the right legal assistance. Battleson Law is a business / corporate, real estate investment, and personal injury law firm with a unique “real world,” owner’s-perspective. In addition to gaining skills from large law firm experience, Mark Battleson has also worked within operating companies and investment firms, and has several years of experience resolving business disputes and defending insurance companies. He’s produced some of the largest verdicts in California – including a record $150 million award. If you want someone who knows how to get results, you need Brian Brandt fighting for you. A highly respected trial attorney, Brian represents people just like you. People who have been seriously injured or who have lost a loved one.